Cheesecake is a great dessert for entertaining. This one is reminiscent of a decadent coffee shop drink with caramel ice cream topping drizzled on top and accented with whipped cream. 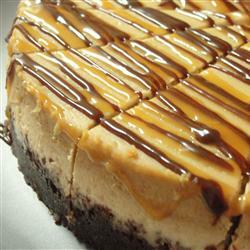 See the linked photos to decide how you want your cheesecake to look. The one pictured here has a double drizzle of caramel syrup and chocolate syrup. Could be good. This would be a wonderfully rich dessert to serve at an Oscar party.